Guillermo Del Toro would make a spectacular mortician. There is so much the Mexican master does with the dead — and not just dead people, but dead feelings, dead times, dead writers, dead styles… It is all dead until Del Toro wants to bring it back to life. He dresses them up for his resurrection, breathing life into them in utterly unexpected and gorgeous ways, making the macabre marvellous and keeping the danse devastating. More than blood or dread, Del Toro’s films flaunt the filmmaker’s fascination for detail, for shadowy off-centre nuance and well-buried corpses that may be prised from between the lines. There is a kind of reader who — in a narrative of mystery — can never resist reading odd words back-to-front to see if they make some sense, to find a clue. I’m forever guilty of that, and that is the kind of spectator Del Toro rewards, slipping little treats into ramshackle corners of story. With Crimson Peak he goes grand guignol — and he does so with such memorable richness that we might as well call it Grand Guillermo. Where else may the opening of a castle door feel like the exploding of a snowglobe? It is a moment so beautiful I could yelp. Del Toro’s film ravishes the eyes, while his cast is cherry-picked to immaculate effect. 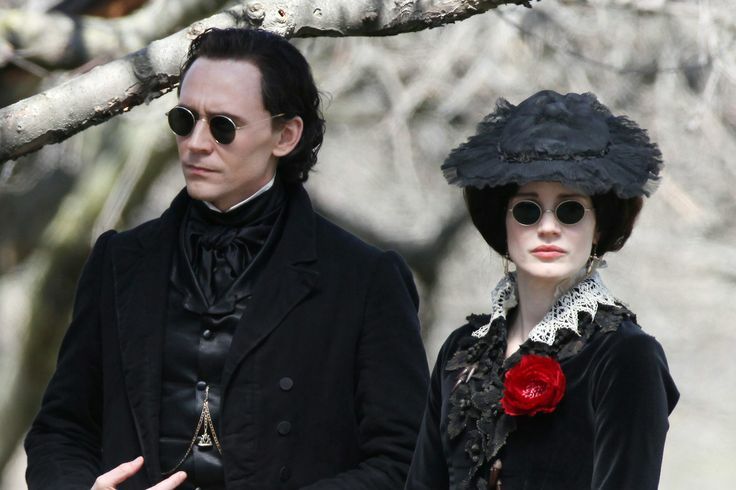 The breathtakingly malleable Mia Wasikowska plays the Mary Shelley admiring writer, and her Only Lovers Left Alive alumnus Tom Hiddleston shows up, top hat and all, as the Baronet with a voice made of velvet and feet fleeting enough to teach Americans how to waltz, European style. This he does while his sister, played by the imperious Jessica Chastain — clad in a fierce oxblood dress with a reptilian back, as if a silken pterodactyl were about to sprout wings — thumps the piano murderously to make it coax out some Chopin. The names are as exaggerated as the woodwork. Wasikowska’s wide-eyed, bespectacled ingenue is named Edith Cushing — in tribute to Hammer Horror legend Peter Cushing, naturally — while the Baronet and his sister are called Lord Thomas and Lady Lucille Sharpe — in tribute, perhaps, to their sheer prickliness. In this film — about a forlorn heroine stuck in a lonely (but spellbindingly beautiful) life — there is a trunk with the name of a character, Enola, not an accident as us backwards-readers would immediately spot. There are ghosts and there are murders, but Del Toro treats them poetically, skating on the thin ice of revulsion but never quite falling through, never pandering, never going all Dario Argento on us even though such situations and opportunities frequently present themselves. The mood may be overwrought, but both composer Fernando Velasquez and cinematographer Dan Laustsen surrender to decorum as costume designer Kate Hawley gets right of way. Above all else, this is a remarkably well-dressed film — the Victorian outfits are worth their weight in essays — and Del Toro, having thus dressed for dinner, is suitably respectful of his old-school subjects, indulging in it all with a sumptuousness rarely found in the genre. He’s like a Willy Wonka of gore, well demonstrated when a character tries to delve into a pool of red clay thickly resting in a vat, its marbled texture making it appear almost good enough to eat. The red clay is why Cumberland, home of the Sharpes, is called Crimson Peak, and why a snowed-down courtyard looks like an Army Of The Dead just marched through it. There, in a dishevelled castle with no roof and innumerable bedrooms, Edith must make her home and fend off both demons she may have imagined and scrambled eggs her sister-in-law may have spiked. Wasikowska is here Alice again, having fallen into a much scarier rabbit-hole, but she commits to the part beautifully even as Hiddleston and Chastain get the plummier, more peculiar roles. Hiddleston, as polished as James Mason, shines as a character who often looks, sounds and feels too good to be true. Chastain, on the other hand, is two parts Hitchcock crone (think Rebecca) and two parts Disney witch (think Snow White), a woman so fearsome that, had we encountered her in an old novel, might keep us waiting for her to draw herself to her full height. The devil — or director, if you will — lies in the details. In the use of the utterly antiquated iris-wipe to separate chapters of narrative, telescoping into either hint or herring and leaving us with something to mull before the next chapter emerges from behind the black curtain. In the way we see Wasikowska — her sleeves made of fabric like butterfly-wings, candelabra in hand, her blonde hair like a waterfall made of judges’ wigs — framed between two doors, doomed and panicking. All while the light flickers, the narrative makes way, and the emotions burst nakedly, even rudely, to the surface. It is as timeless as it can be, and yet so astonishingly original. 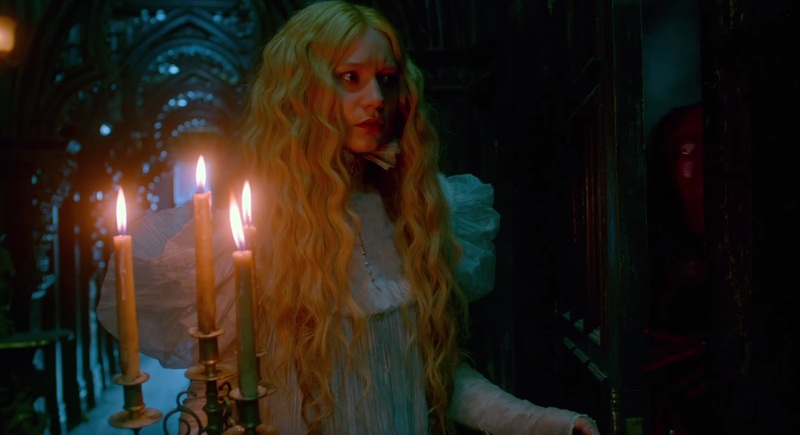 Crimson Peak is not for everyone, but the mood is set very early on. Give in to Del Toro’s libretto of lunacy and you will revel in something quite astounding. It is the kind of film that several Indian filmmakers, forever mired by convention, should be made to watch in order to understand how the truly gifted can celebrate classicism instead of being trapped by it. I, for one, can pledge that if a knife were ever lodged deep through my cheekbone, I’d want Guillermo Del Toro to yank it out — regardless of consequence, he’d make it worth looking at. Wow… Ur review inspires me to watch this. I am going to watch.